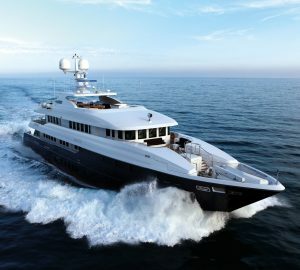 Lauren L is 90m/295ft long, has her own helipad, 50-inch plasma TVs and space for 150 guests. 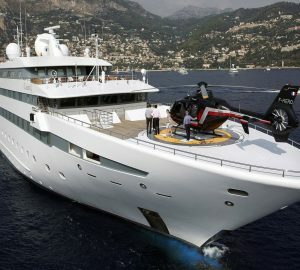 She sleeps 40 guests and 45 crew with sufficient places to sit 50 people in comfort at a formal dinner. 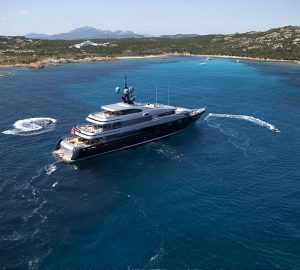 With four large decks and 20 state rooms this is one superyacht that exceeds all expectations. 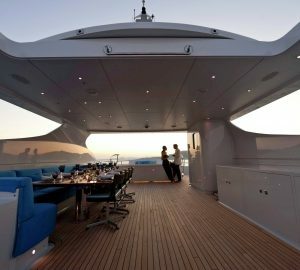 This vessel has a unique rooftop terrace which is ideal for large parties of guests to hold a party or special celebration. The terrace also serves as a sun deck or a quiet place during the day to enjoy a cocktail or two. 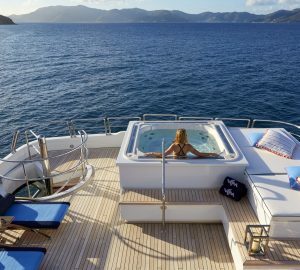 The gym, spa, top deck bar and sunbathing platform are also fantastic features along with a beautiful, bubbling Jacuzzi. 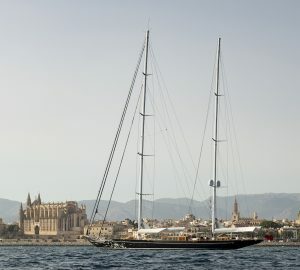 Whether you wish to sail to the Med in the summer or the Caribbean in winter, Lauren L will take you on a dream voyage. Lauren L has 20 superbly appointed state rooms. The owner’s suite is situated on the bridge deck. It has a lounge, balcony, a king size Californian bed and dressing room. With its state-of-the-art entertainment system, walk-in wardrobe, en suite bathroom with a double size spa bath and office, this suite is just out of this world. There’s an additional VIP cabin on the bridge deck plus three executive suites all having separate living areas and en suite bathrooms. Ten luxurious guest rooms can be found on the upper deck, again each having an en suite. Lastly, five double cabins are on the main deck, all beautifully decorated and furnished in sheer luxury. Refitted recently by Mokka Design and Elysee Yachts, Lauren L is elegant, classic and stylish. 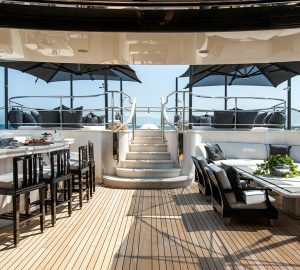 These two areas on board this superyacht are all about relaxation, style and superb décor. Have a cocktail from the bar, listen to a favourite tune being played on the grand piano or chat with friends here. The main lounge, conference centre and library all have multi-media systems. Outside there’s a dining area seating up to 50 guests while in the formal dining room you can enjoy delicious, gourmet meals. Lauren L’s chefs prepare amazing dishes which are equal to many leading restaurants found all over the world. Typical menus comprise fois gras ravioli and chicken served with tea jus and citrus emulsion. Fish courses of sashimi of mirin-seared yellow fin tuna with avocado and apple dressing are absolutely mouth-watering. Why not try Antiguan lobster tail confit in ginger butter with udon noodles and miso greens? To finish dinner off, a sorbet of raspberry and mango carpaccio is perfect. This dish is accompanied by palette cleansers mint and sake. Desserts of salted caramel, crème fraiche, candied lemon and brioche stack with chocolate mousse will have you coming back for more. After eating a superb meal, step into the main saloon with its bar and grand piano. Sofas in shades of duck egg blue and cream make an instant welcome with their light, fresh yet contemporary feel. There are often Caribbean-themed parties on board too which take place on the huge sun deck. Enjoy refreshing cocktails, live music and canapes with the lit-up Jacuzzi in the background providing a focal point. During the day, the sun deck is great for sunbathing, unwinding or socialising with friends, colleagues and family. Lauren L is known for its sensational water toys too. There’s a Seadoo Bombardier speed boat, a stand-up jet ski, 4 sea bobs and 3 wave runners. Give the Duarry super cat speed boat a try or have fun on one of the towable toys. Children will love the inflatable tubes and banana boats, what fun. For those who like to feel the spray of the sea on their faces, water skis, water boards and wind surfers provide all the thrills needed. Divers can make use of the Bauer diving compressor to see fascinating marine life deep down on the ocean bed. The children’s play room is full of toys which will keep them entertained for hours. Take this opportunity to pamper yourself in the pool, spa or sauna while they play. Have a facial, manicure, pedicure or try a new hairstyle. Professional beauticians are available, at an extra cost, to see to your every whim. On the sun deck there’s a steam room, beauty salon, aromatherapy room, a full-size gym and a massage room. Expect the highest quality of treatments no matter which one you decide to indulge in. After a day of pampering, you’ll be ready for an evening meal al fresco, dining under the stars. 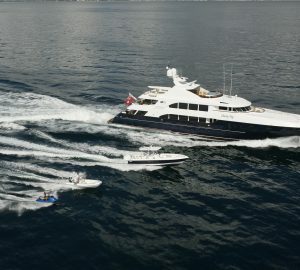 Whether it’s a day of spoiling yourself in the beauty salon, hosting a glamorous party, a business meeting or divine dining, Lauren L offers the ultimate in superyacht charter vacations.